Background: The ultimate emergence of multidrug resistance remains a severe limitation of chemotherapy treatment for patients with cancer. 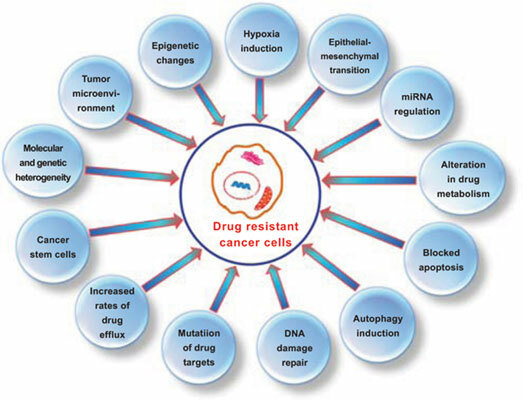 The best-characterized cause of drug resistance involves the overexpression of P-glycoprotein (Pgp), which decreases the intracellular accumulation of chemotherapeutic agents in drug-resistant cancer cells. Thus, Pgp has become an attractive potential target for treating chemotherapy-resistant cancer, but the outcomes of using chemotherapy in combination with Pgp inhibitors in clinical trials to date have been disappointing. Objective: We herein examine the relationship between Pgp and drug resistance and update the strategies for overcoming drug resistance by targeting Pgp, with a special focus on the recent progress in the area of preventing the development of drug resistance by targeting Pgp both in vitro and in vivo. Given the essential roles of drug-resistant cancer models in these investigations, commonly used approaches for establishing drug-resistant models in the laboratory are also addressed. Conclusion: Considering the roles of Pgp in normal physiological conditions and its appreciated roles in detoxification, the currently available Pgp inhibitors undoubtedly cannot be used to reverse drug resistance in the clinic. Although agents that target Pgp to prevent and/or reverse drug resistance are not beneficial at the doses used in the laboratory when administered to patients with cancer who are enrolled in clinical trials, compounds targeting Pgp are widely acknowledged to be promising for circumventing drug resistance. Multidrug resistance, P-glycoprotein, P-glycoprotein inhibitor, drug resistant models establishment.